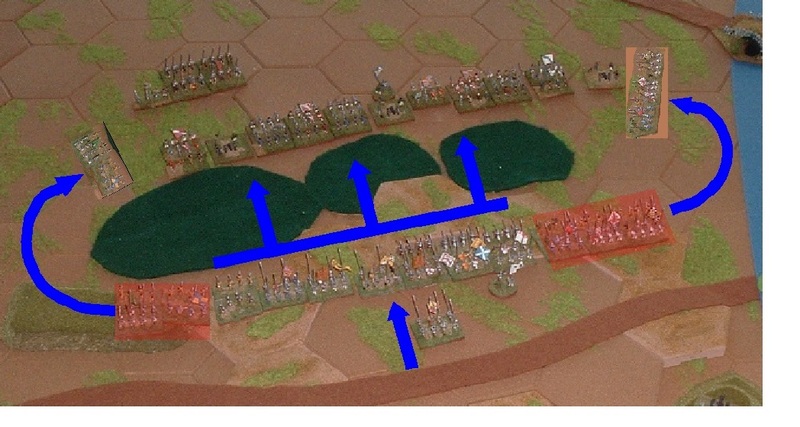 Flank attacks to minimize casualties from the artillery and archers. Centre to attack all along the line. Rules were based on Hordes of the Things (HOTT) with a dash of One Hour Wargames and Kallistra Hordes and Heroes Medieval. Side that's ahead at the end of ten turns is the winner. Scots infantry advances and archers shoot. English lose an artillery unit to a Highland charge! English Cavalry advances, artillery and archers shoot. Scots advance to contact on the left, archers shoot. Combat continues, English lose an archer unit. Infantry now in action along the whole line. Combat continues. English lose another artillery unit. Combat continues, English lose a cavalry unit, last artillery unit and an archer unit. Combat continues, English lose a cavalry unit. Combat continues, English lose a third cavalry unit. Scots lose an archer unit, English lose last cavalry unit and two archer units. The English right wing is now destroyed. Clear win for Scots at end of turn ten; Scots lost one element, the English lost 13. Layout too restricted, the armies started out too close together. Could have omitted Flodden hill with the Scots artillery completely and had the Scots starting on high ground nearer their base edge. Archers too strong in close combat, almost equaling armoured infantry. Because they ended up sandwiched between the opposing infantries, this eroded the Scots infantry, so when the archers were finally destroyed the Scots infantry met the English infantry at a disadvantage in hit points. Rule mod required. Deployment of the archers on both sides was flawed. They ended up being used as hand-to-hand infantry. Probably better if they had been divided up between both flanks on each side; once battle was joined they could have become supporting units on overlaps. I believe in the real battle, the Stanley contingent was able to outflank the Scots right and cut through them. The disorder of the Scots crossing the wetlands at the bottom of the valley may have helped the English too. The whole thing was an example of how not to fight a battle. Infantry unfamiliar and not properly trained in the use of their principal weapon, sent over ground guaranteed to disorder them and up against a weapon in the English bill which was superior in close-in fighting. I think the only way to get a true result in a game would be to use so many combat modifiers as to render the whole exercise pointless. I rather agree! We actually refought flodden several times at our club, and the poor Scots always lost. The real battle was won by Surrey's outflanking of the Scots army which turned them out of their position before the battle. The battlefield today gives a good impression of how hard it would have been for the Attacking Scots. Thanks for the comment Norm. Couldn't agree more re missile troops. Could use pass through but then they fall foul of the usual rule that archers can't fire over anyone. Hordes and Heroes has a neat skirmishing mechanism which does not allow archers to indulge in h-to-h. I think I'll adopt this as an option for all archers.